Honeymoon Offer – Stay for your honeymoon and save up to 30% Off & Complimentary Half Board on villa rates. Please contact us for further details. The Constance Ephélia is a luxury resort hotel situated on the island of Mahé in the Seychelles. This exquisite retreat offers a chance to relax and indulge with the U Spa, soothing yoga classes, fishing and guided bike tours. Relax in one of the hotel’s four swimming pools, explore its stunning dive spots, and for that special souvenir visit their in house boutique shops. Choose from Junior Suites, luxurious Senior Suites or family villas with their own private pools, and make the most of your Seychelles holiday. 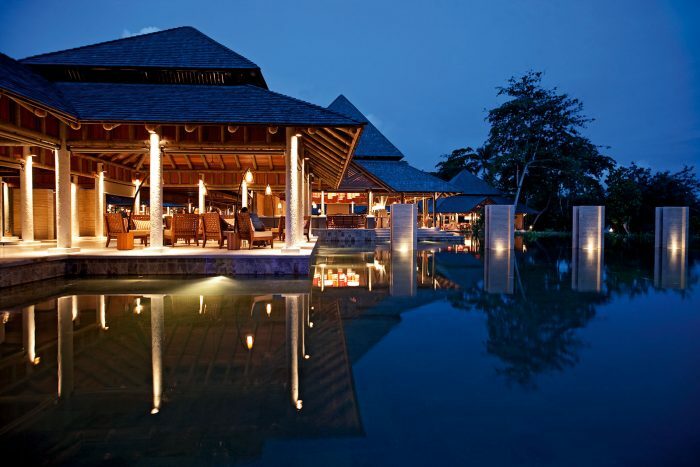 Charming poolside bars, with their ambient lighting for evening cocktails, are perfect places to wind down under the stars. You can book a private meal on the beach, watching the sun set as you sip a glass of wine, or could instead dine in one of the Constance Ephélia’s 5 restaurants. Try the Corossol “Live” buffet restaurant, an interactive cuisine experience serving dishes from all corners of the globe, truly an experience to be savoured. Early Booking Offer – Book at least 93 days in advance and save up to 35% off your room rate for stays of at least 4 nights. Honeymoon Offer – Stay for your honeymoon and save up to 30% Off & Complimentary Half Board on villa rates. The purpose built U Spa village is set in the resort’s tropical gardens. Here you can detox,re-hydrate, rejuvenate or just relax. Your treatments can be tailored with the preferences noted on your individual Spa Experience Card. Classic treatments use natural products inspired by plants from the Indian Ocean. The U SPA facilities include a Sauna, Steam room, Jacuzzi, Reflective pool & Cold plunge pool. There are 5 stores within the property. For those shopping urges and needs, including: clothing; Constance branded items; basic day to day items; and Seychelles art and handmade craft items. Younger guests aged between 4-11 can enjoy the Constance Kids’ Club. Fully trained Coordinators carry out exploration trips of island, local crafts & culinary activities and scavenger hunts among other exciting activities. Non-motorised water sports e.g. Pedal Boats; Kayaking & Windsurfing. Take part in invigorating water sports or simply relax in one of the 4 swimming pools in which you and your loved one can relax side by side, this resorts feels like it was built for Honeymooners. Pamper yourself with enchanting poolside cocktails while taking in the incredible views. Indulge in a couples massage from the Shiseido Collection, a range of holistic treatments designed to balance the vital energy in the body, and said to make you beautiful from the inside out. The Constance Ephélia is where you can learn more about yourself as you fall even deeper in love with your partner, soothed by calming yoga or the gentle bubbling of the Jacuzzi. Dine overlooking the marine park, relax in your suite with your favourite music playing or treat that special someone to a honeymoon shopping experience at the resort’s boutique shops. Choose from five restaurants at the Constance Ephélia Resort, something for everyone. At Corossol, walk from station to station picking pizzas and pasta, Asian dishes and mouthwatering desserts, and interact with the chefs. At the Helios Mediterranean Buffet food is prepared within a wood-burning oven for an authentic smoky taste. For Asian cuisine, dine at Adam & Eve with its busy open kitchen. Signature dishes are served at Cyann, which is the Constance Ephélia’s speciality restaurant overlooking Port Launay’s marine park. Cyann also features a poolside sushi bar and serves low calorie dishes. Seselwa provides a more casual dining atmosphere by the North Beach, with buffet breakfasts and freshly grilled seafood on offer.